Out of the gate the largest event of its kind on the West Coast, the American Documentary Film Festival hits a winning stride. 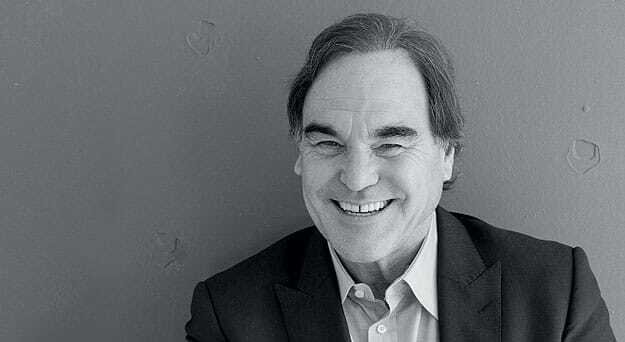 Legendary filmmaker Oliver Stone, a former Palm Desert homeowner who continues coming to the area to visit his mother, tops the bill at the festival, which runs March 29 to April 5 at Camelot Theatres in Palm Springs. He’ll receive the inaugural festival’s lifetime achievement award and screen five rarely seen documentaries: Comandante (2003), Persona Non Grata (2003), South of the Border (2009), Looking for Fidel (2011), and Castro in Winter (2012). Stone has directed 19 feature films, with Savages — about the Mexican drug cartels and starring Uma Thurman and John Travolta — due for release in September. The three-time Academy Award winner sat down with Palm Springs Life to discuss his documentary career and his expanding nonfiction legacy. What is your history with Palm Springs? I bought a place in 1979 in Palm Desert, where I used to go with my former wife and child. In the 1990s, my mother, who lived in New York, took a liking to the weather and social life in the Coachella Valley and ended up moving here. I occasionally spend weekends with her. I always find the desert a beautiful place. I sleep well, it’s comfortable, and it’s a good place to catch up. I think I’ve shot two or three scenes in the deserts around here. How did you get into documentary filmmaking? I never intended to specifically go into it. It was an offshoot of filming features. Often in my feature work, I would sometimes veer toward the documentary style as an approach. At NYU film school, we shot low-budget films with real people all the time. Some of them had real-life roles to play. I remember a big documentary I worked on in 1970 called Street Scenes about the student protests against the Cambodian invasion. We had our cameras smashed by construction workers on Wall Street. Martin Scorsese, one of our teachers at the time, ended up being the supervising director/editor, so to speak, and the film was released in the New York Film Festival at that time. The film school was filled with a lot of provocative people who, like Occupy Wall Street, wanted to bring change to the world. Later, after I had done many features, I felt the need to go back to the “real” world. I had always done a lot of research on the features involving real people, and documentaries were a continuation of that. How did you come to make three documentaries about Fidel Castro? By happenstance, a friend of mine, Fernando Sulichin, a Spanish producer born in Argentina, had access; and we took advantage of it. We ended up spending five days in Cuba, three of which we were shooting with [Castro]. After our initial seven-hour dinner, a breakthrough was achieved; and he allowed us to film him without cutting. For me, it’s a fascinating inside look at how a man like that works and thinks. I think whatever your politics or ideologies may be, you can learn a lot by just looking into the eyes of the man. I personally feel the camera reveals a genuine man. In any case, the anti-Castro forces in this country were so upset at the idea of him presenting his own point of view in a film to the American public that they were heavily criticizing my film before it was seen. There was a limited showing at Sundance in January 2003, and all sides jumped on it like a political football. To make a long story short, HBO was about to release it and was advertising it on the air with two weeks to go when suddenly Castro cracked down and executed some hijackers and put some dissidents in prison because there was an upsurge of what many feel was a CIA-sponsored rebellion on the island. HBO canceled the 90-minute documentary without any warning to me, and it has since never played in the mainstream. They did agree, eventually, to finance a second film where I went back to Cuba to question him about the previous incidents and why he cracked down on the dissidents as well as the hijackers. His responses are on camera. The film is called Looking for Fidel; and, frankly, I have never seen Castro grilled like this. I don’t think he would ever allow it, and at times he does get upset with me. Although I kept pressing him on all the issues the U.S. State Department wanted answered, I don’t think he could answer any of them in a way that would’ve been suitable to the U.S. bureaucrats. It is a film in which Castro truly unloads his inner feelings on the United States and politics. And the third Castro documentary? I returned in 2010, just before doing Wall Street: Money Never Sleeps; and we made another 60-minute film called Castro in Winter, a picture of him at his villa in retirement. We meet his wife briefly and his children. He was very open with me, and it has an autumnal mood. In the course of time, in all three films, what emerges is a portrait of a man and something that I feel very proud of. I do tend to root for the underdog; and I do think, in the end, that Castro has been the veritable underdog who has lasted through 10 American presidents. Tell us about the other two documentaries being shown at the festival: Persona Non Grata and South of the Border. In Persona Non Grata, we found ourselves in the heart of Ramallah, the administrative capital of the Palestinian National Authority, waiting for an interview with Yasser Arafat when the Israeli military invaded in 2002. The film is quite interesting and has many elements of humor. We talked to many sides. We visited Shimon Peres, Ehud Barak, and Benjamin Netanyahu, but Prime Minister Ariel Sharon would not meet. On the Palestinian side, we met with the earliest version of the al-Aqsa Martyrs Brigade. They were young, masked, and very dedicated. They told us a story that, I think, needed to be heard. I think the film is recognized as being balanced and well reviewed, but not many people have seen it. It came and went rather quickly on HBO. South of the Border is about a new South America that North Americans do not really know about. The evolutions in these countries have been occurring ever since the International Monetary Fund essentially forced a set of conditions on them in the 1980s and ’90s that really backfired. From this grew a series of democratic elections in Argentina, Bolivia, Ecuador, Venezuela, and Brazil that upset the map of South America. Suddenly, the United States was being chased off the continent, except for its bases in Colombia. We treated it like a real road trip. I met with seven presidents; and it goes by pretty fast, so we can’t deal with all the problems in South America. But we are saying, “Meet these people. These are the new leaders, and they are all saying the same thing: ‘Enough of the Yankee mentality, and enough of the IMF!’” It took a lot of guts to do what they did. A special highlight [in the film] is President Néstor Kirchner of Argentina talking with George W. Bush about [Kirchner’s] refusal to go along with the IMF positions. Kirchner took Argentina into bankruptcy, and emerged with a far stronger economy. Great story. What motivates your recent interest in getting back into documentaries? I think my children and the younger generation. I think it’s something I can contribute. I’ve been working on The Untold History of the United States for the past four years, and it is quite possibly the most difficult film I’ve ever worked on. It’s 10 one-hour shows that travel back and forth, not necessarily in chronological order, from 1900 to 2012. It’s an alternate study of history. It hardly covers all, but it does cover key points. For example, it questions the Cold War — who started it and why. I think it’ll turn some “old history” on its head. We take you through some of our policies and how they grew through time into an addiction to war and power. It’s perhaps the most powerful documentary I’ve done. There are no interviews; it’s all archival material, with the narrative written by Peter Kuznick, who is a professor of nuclear studies at American University in Washington, D.C., and me. It comes out on Showtime in May. That’s the plan right now. How do you feel critics will react to your take on U.S. history? One can never say, but I’m sure some of them will be very negative and will make fun. But there’s a strength to this thing. It’s like leaving behind a legacy. This is for the kids, for the future. You didn’t hear about this history, because I didn’t get it in school — and I went to some pretty good schools. I want to finish my life right. I want it to be the best work I’ve done. The other documentaries I enjoyed, but they were essentially road movies. This is a classic documentary done with style, editing, and a narrative that will make it entertaining to watch World War II without saying, “Oh, I’ve seen his before.” That’s the secret. It’s the hardest thing to do, to make something fresh. Why do people think you’re controversial? I’m not looking for fights. I just don’t want to run from what I think is the truth.